With only one day left before America votes on its 45th President, Hillary Clinton's polling lead over Donald Trump has narrowed significantly in recent days and the presidential race looks as heated as ever before. Millions of Americans have already decided who they are voting for and it’s really easy for one to notice the United States' obvious divided political climate. But what does this divide say about their supporters? Why do some of us identify as conservatives, and others as liberals? According to some scientists, the answer lies partially in the make-up of our brains. Despite most people thinking that this happens solely because of the socioeconomic and ideological built-in differences between Democrats and Republicans, a number of scientific studies have found that biology may be linked with political orientation as well. Further, scientists suggest that history and biology not only could possibly be factors in political orientation, but may also mean that the ideology a person identifies with changes a person's ability to perform certain tasks. In case you happen to be one of those people who wonder how everything started, you would be amazed to learn that the two extremely popular party animals have been on the political scene since the 19th century. Specifically, the Democratic Party’s donkey started as an insult during Andrew Jackson's 1828 presidential campaign, when his political opponents labeled him as a "jackass." Known for being stubborn and obstinate, Jackson decided to use the insult in his favor and began putting the strong-willed animal on his election posters. As it turned out, Jackson defeated incumbent John Quincy Adams and became America’s first Democratic president. In the 1870s, influential political cartoonist Thomas Nast, who’s widely considered the father of the modern political cartoon, helped popularize the donkey as a symbol for the entire Democratic Party. Although, Nast wouldn’t be happy until he would also invent another famous symbol: the Republican elephant. 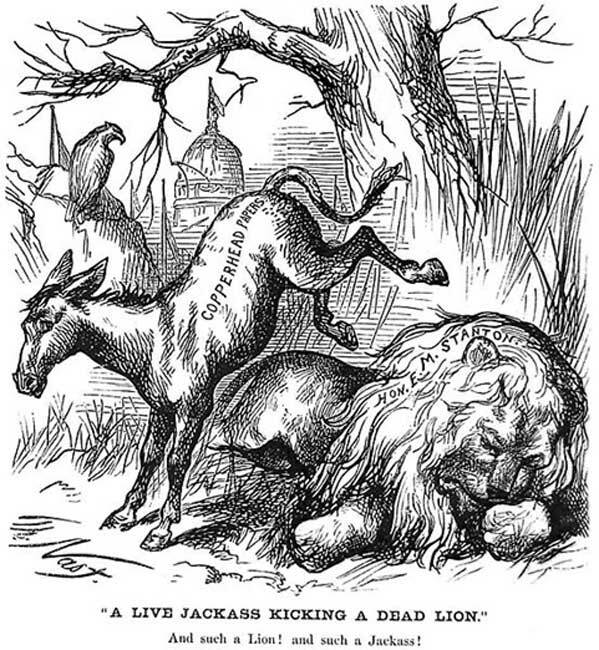 In a cartoon that first appeared in Harper's Weekly in 1874, Nast drew a donkey clothed in lion's skin, intimidating the rest of the animals at the zoo. One of those animals was the elephant that some labeled “The Republican Vote.” That's all it took for the elephant to become associated with the Republican Party. During the 1870s, Nast used the elephant to represent Republicans in additional cartoons, and by 1880 other artists were using the same symbol for the party. Today, Democrats claim that the donkey is a very smart and brave animal, while Republicans say the elephant is extremely strong and dignified. Obviously, their favoritism has a lot to do with the fact that these two animals are seen as the absolute symbols of their political parties, but it makes you wonder if the selection of these two animals, and one’s affiliation to one or the other, is as random and simple as it appears to be. The theory that nothing happens coincidentally in politics, seems to be verified by a 2011 study conducted by cognitive neuroscientist Ryota Kanai's group at University College London published in Current Biology, and which found a connection between differences in political views and differences in brain structures in a convenience sample of students from University College London. The scientists involved to the study performed MRI scans on the brains of ninety volunteer students who had previously openly indicated their political preference on a five-point scale ranging from “very liberal” to “very conservative”. Students who reported more conservative political views tended to have larger amygdalae, a structure in the temporal lobes that performs a primary role in the processing and memory of emotions. Further, they found clusters in which gray matter volume was significantly associated with conservativism in the left insula and the right entorhinal cortex. There is evidence that conservatives are more sensitive to disgust and the insula is involved in the feeling of disgust. On the other hand, more liberal students tended to have a larger volume of grey matter in the anterior cingulate cortex, a structure of the brain associated with monitoring uncertainty and handling conflicting information. In an interview with LiveScience, Ryota Kanai said, "It's very unlikely that actual political orientation is directly encoded in these brain regions", and that, "more work is needed to determine how these brain structures mediate the formation of political attitude." Kanai and colleagues added that is very important to conduct a detailed study to find out whether the changes in brain structure that they observed lead to changes in political behavior or whether political attitudes and behavior instead result in changes of brain structure. Another study , found that people with right-wing views had greater skin conductance response, indicating greater sympathetic nervous system response to threatening images than those with left-wing views, even though there was no difference for positive or neutral images. Holding right-wing views was also linked with a stronger startle reflex as measured by strength of eye blink in response to unexpected noise. But again, many scientists can’t agree that such neurological differences are capable to define people’s choices on politics. It seems that when it comes to politics, most people tend to have pretty strong opinions, and aren't always so receptive to conflicting ideologies not because of the various signals transmitted to their brain by their nervous system, but due to what they have been brainwashed to believe from young age. Could One Still Switch His/Her Political Affiliation? A 2004 study on political judgment and decision-making also showed the ubiquity of emotion-biased motivated reasoning. Motivated reasoning is a form of implicit emotion regulation in which the brain converges on judgments that minimize negative and maximize positive affect states associated with threat to or attainment of motives. To what extent, however, motivated reasoning engages neural circuits involved in “cold” reasoning and conscious emotion regulation is still unknown. So, someone who’s reading this now is probably wondering: Can I still switch my political affiliation, or it’s more complicated than I originally thought? Well, to make a long story short, one could definitely switch affiliations, even though if you take a better look at politics, people rarely do so. Why this happens? Even most scientists are not really sure if that happens because of some neural obstacles that prevent you from crossing the aisle. In conclusion, it would be safe to claim that political affiliation is undoubtedly influenced by cultural factors such as family upbringing, religion, ethnicity and geographical location, even though various studies have clearly showed recently that biology plays an important role as well, predisposing us to adopt certain political ideologies, and also preventing us from letting them go. The problem, however, is that it’s impossible to predict at this time how much more scientists will learn in a decade from now about the social, cognitive, and motivational structures and functions of political belief systems, especially if cooperation among psychologists, political scientists, neuroscientists, and geneticists simply continues apace. So, the next time you try to make a valid point during a political debate, just keep in mind that changing someone's mind or political views, is probably as difficult as changing their brain. Not sure why Ancient Origins would publish this article - what is the connection? But I will agree to the extent that Democrats do engender feelings of disgust, if that is what the article is trying to convey. I think r/K selection is more accurate. Interesting about the origins of the donkey and elephant, though.